Homemade Cars Pit Pass Invitation Template and Tutorial - Oh, The Things We'll Make! 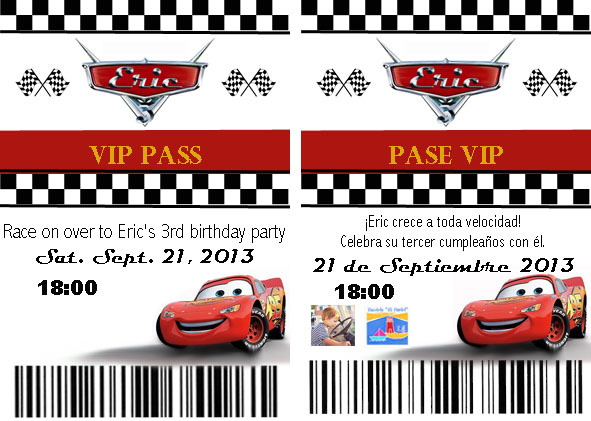 You can easily make homemade Cars pit pass invitations with my invitation template and tutorial. Despite not knowing where the party would even be held (we are doing some construction at home), I had already begun to make the invitations weeks ago. I had thought about making race ticket invitations, but when I looked up what a race ticket actually looked like, I also saw VIP passes of sorts, and thought a Cars pit pass invitation would be cuter. Just as almost everything that one can think of, somebody has pretty much always already done it. While searching the internet for ideas, I found people who had already done similar pit passes for their kids' parties. 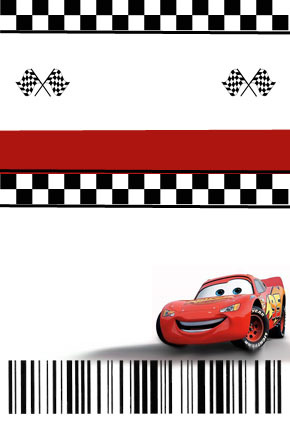 To begin making the top part of the invitation with my son's name written in the Cars logo, I started by downloading the blank logo here. Then, in Photoshop, I wrote his name in Magneto Bold font (free download). I used the second half of this tutorial, and a bit of experimentation, to get the chrome look that I wanted. I played around with photoshop for awhile, and I came up with the above template. Feel free to download mine (Or here with writing that you can change) and use it yourself for your party! I then added my customized logo and the information about the party with options for both Spanish and English, of course. Here is my customized logo with my son's name in photoshop format, so you can easily change it to the name you want without having to adjust all of the settings. I came up with these. I added a picture of my son, along with the logo of my friend's preschool where we will be holding the party, on the Spanish pit pass invitation. Once I had the pit pass invitation all planned out, I wanted to make them look authentic, so I printed them out on a thick photo paper and laminated each pit pass. I then punched a hole in the top for my homemade lanyards. I would have bought the lanyards, but surprisingly lanyards, at least the ones available for shipping to Spain, are pretty expensive! Even when buying in bulk, I couldn't find any for much less than a euro a piece. I wasn't about to spend that much, especially since we had an idea to give one to everybody who comes to the party. That would add up pretty quickly! So, instead, I bought red cord wherever I could find any. Even something as simple as that can prove to be difficult here. One day, though, I found the perfect find: Cars shoelaces. They weren't as cheap as the red cord, and there were only a few left, but I snatched up all of the remaining shoelaces. 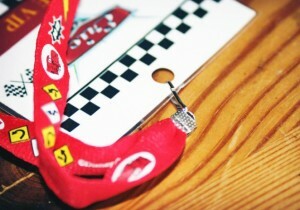 Once I had my cord ready, I still wasn't sure how I was going attach it to the pit passes. I decided I'd need some sort of lanyard clip, but couldn't find any anywhere either, so I ordered some tiny ones over the internet. I still wasn't sure how to attach the the lanyard clips to the cord. Just when I was about to give up, I found some crimp end findings at a local store. They're great because they hold the two ends of the cord together and have a loop for hooking in the lanyard clips. To help fit the cord ends in the crimp end findings more easily, and to ensure they wouldn't unravel, I first burnt the ends of the cord, and pinched the two ends of the cord together. 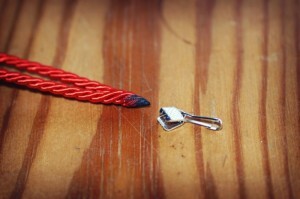 The melted cord united both ends, keeping them together even without the findings. I then crimped the findings over the burnt ends. I finally was able to hook the lanyard clips though both the loop on the findings and through my hole in the pit pass invitations, and that was it! At the party, everybody wore their passes. I had originally planned on only giving them out to the kids, but they ended up being so quick, easy and cheap to make, that I made some for everybody. How can I edit name on logo once opened in photoshop? TIA! If you click on the text with the text tool, you should be able to change the name. Make sure the layer with the text is highlighted in the layers panel (bottom right) or you won’t be able to edit it. I love your invite! I’m planning a party for my little boy 3rd birthday and he’s just watched Cars last month and is obsessed! I downloaded them and customised them in Photoshop and now can’t wait to send them out! Thank you so much for sharing them! I have an old version of Photoshop still. I think it’s Adobe Photoshop CS4 or 5. They are Adobe Photoshop files, and need to be edited in some version of Photoshop. I doubt other software would work with the format. Are you using some version of Photoshop and still having issues? I was just going through old comments and noticed that my reply to you never went through. I specifically remember answering you, but something must have gone wrong when I tried to post it. I’m very sorry that I didn’t get back to you sooner. I used Adobe Photoshop, and older version, CS5. This is a Photoshop file, so you need to use Photoshop to edit them rather than some other photo editing software. If there’s anything I can help you with, just let me know! I just used your template, and played around with Word, and the invitations came out PERFECT! Thank you so very much for allowing us to use your design. My son absolutely loves it! I’m so happy to hear it! You’re very welcome! Hi, I loved how you did it. Could it be possible for you to send me the editable file? I am not being able to make it, and my son Benja is turning 3. I am trying to make the cars logo with his name on it. It’s for editing in Photoshop. I’m planning my twin boys 3rd birthday. Any chance you can email me your templates? They’re awesome! They should all download correctly now in the links within the blog post. I didn’t know how to host Photoshop files, so I used to have to email each person the template individually, but now that I’ve figured it out, I have them all available for immediate downloading within the post. I hope your sons have a very happy birthday! If you have any issues, let me know and I can email them to you. I thought I’d answer like this first, though, because it gives me feedback on what is working and what isn’t! Hi! I just came across your site tonight after searching online for while! I’ve been trying to get my son’s name “jack” in that Cars logo but not having much luck! Can this only be done in Photoshop? I’m asking bc I don’t have photoshop 🙁 is there anyway to email me an editable word file so I can put in his name? Please let me know when u can as his cars themed party is on Saturday… Thanks so much in advance!! I actually don’t have Word myself! I would have no idea how to do that even if I did. You caught me running out of the house now, but when I get home, I’ll try to remember to look to see if I can find my editable file, and see if I can try to help you out. The other option is to try https://pixlr.com/editor/. It’s very similar to photoshop- and done online. You may be able to fix it there. I haven’t tried it, though, to know for sure! I’m so happy that you were able to use it and that it has helped you out. Amazing work! Thanks a lot for sharing the template! My son’s 5th birthday party looks too promising, thanks to your invitation! You have amazed all our invitees. FYI, this template is now also available in Greek! Cheers from Athens! I’m happy I was able to help you, and hope your son has a very happy birthday! I’m currently away from my computer, but I’ll try to find the files for you and send them to you later on today. I’m sure you are probably getting sick of emailing everyone but I couldn’t seem to figure out how to download the pit passes, and believe me, it pains me to even ask as I always roll my eyes at those who appear not even to bother trying to download it themselves first before asking haha! I have it on my other computer, and will try to get them out to both you and Michal today! I’ll try to fix the links. I’ve been working on getting some of the older links fixed lately. It’s hard because my hosting company won’t let me host my photoshop images on my blog, but I’ll try Google Docs perhaps. I think I have fixed the links now. Could you please check and let me know if you can or can’t download from there. If not, I’ll be happy to email them to you! I love these! Sorry, I can’t download this as well. Where you able to locate the file on your computer? I would love it if you could email them to me. With Darrell on it? If not then, it’s okay. I recently lost all of the files on my computer, but I suspect that I should have a backup of this on one of my hard drives. I’ll look for it tomorrow for you! I was reading some of the comments and noticed you were emailing some. I LOVE this. I have been working on trying to make a logo like this for over a week not and just can’t get it. Would you send me one with my son’s name Levi on it? He turns one in two weeks. Thank you!!! I also cannot open the template, would you mind emailing it to me also? This is exactly what I was looking for!!! Hi Tracy! I love the cars logo with Eric. My twins turn 3 next weekend and I would love to use that for their birthday decorations. Is there any way you could email it to me? You’re work is amazing! I’ll send you an email right now! Wish them a happy birthday from me. Hey! I came across your work. It’s wonderful. My baby will be having his 2nd birthday this coming September. I want to ask for your permission if I can use your pit pass template 🙂 I tried to l click the “dowmload mine” in the template. However, I am getting an error :(( #unsuccessful Thanks . In any case, I have sent you templates in various formats. Happy birthday to your baby! I hope you have a great party. Now I'm making some stuffs for my son's 4th BD party.In Japan, there's not much partygoods that I want. but I'm not good at PC so if you dont mind, could you make me the cars logo with my son's name ?his name is Sora. What a great web page, your very talented. Thank you so much for sharing your ideas and templates. I was looking for an idea similar to yours for my Son’s birthday party in a few weeks when I found your page online. I think I will use your ideas if you don’t mind as its professional and so effective. I don’t have Photoshop, can this project be done in any of the Office products? Could you possibly email me the the Car Logo with my Son’s name? I have sent you an email. I hope Aaron has a great birthday!! This is so great. Thank you for sharing. I too was unable to download the template for the pass. If you could find the time to email it to me I would GREATLY appreciate it. I really want this party to be great. My son is turning two and he is my third child so I want to make sure that his parties are as great as the first kids were….. I have been driving myself crazy trying to create all of this in MS Paint because I do not have photoshop. Please let me know if you are able to email the pass template. Thanks a million either way. Of course, I’ll send it to you. I’m looking into the best way to share files. I can’t upload photoshop files, and my other file sizes are altered automatically when I upload them, so I don’t want to use that method here. I love your pit passes. My son’s birthday is happening in two weeks and your template will knock out another to do for me. Would you mind emailing it to me? I couldn’t download it. The name is editable yes? I need to look into changing the way to download these. 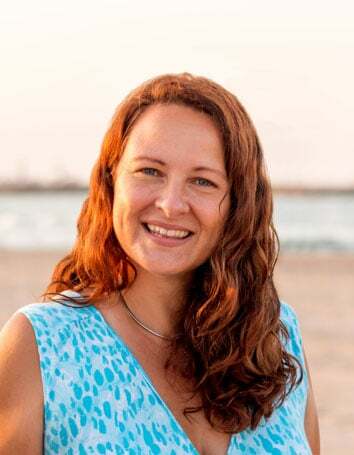 🙂 I was using that service for sharing files when my blog was hosted at Blogger and I had no means of sharing them through my host, but now that I pay for hosting, I should be able to upload the files to my hosting service and more easily share them that way. That said, while I am trying to figure out that process, I will happily email you the files. I hope they work out for you! Hi, I really like how you did the vip passes, i was wondering where did you get the laminated and what size did you print them? I used Photoshop to fit 6 invitations on each sheet of A4 (Standard European size paper- similar to letter, but a bit wider and shorter). There were 3 across width-wise. I did it that way to get the most I could out of each sheet of photo paper. I actually have an inexpensive laminating machine, so I used that. Here most paper stores will laminate things for you pretty inexpensively, so you could try that. You could always use transparent contact paper in front and behind (facing each other), too, but it would probably be a bit flimsier. Thank you for making your photoshop template available. I was going to make a similar pit pass and came across yours, which is very cute and which would save me a lot of time. Unfortunately, I wasn’t able to download your file. Is there a way you could send it to me by email? …and, if so, do you think you can send me the file with “Eric/3” if the text is editable? I only have Photoshop Elements and can’t get that chrome look. Thanks so much! Let me look for it when I get to my computer, and I’ll send it to the email you used to comment! Hello! I would greatly appreciate if you could send me your template. Thank you so much!! I didn’t used to have them for download within the post, but you can now download any of the templates through the links in the post.